A mix of clouds and sun. A stray shower or thunderstorm is possible. High near 80F. Winds N at 5 to 10 mph.. The deceased are from Tucson unless otherwise noted. Andruczk, Luanne, 73, respiratory care therapist, April 5, Bring’s Broadway. Ballou Jr., John, 74, technician, April 5, Bring’s Broadway. Barclay, Arlene, 90, cosmetologist, April 7, Bring’s Broadway. Brown, Ruth, 78, buyer, April 8, Bring’s Broadway. Casillas, Becky, 72, banker, Oro Valley, April 9, Marana Mortuary. Dorgan, Patricia, 65, social worker, April 11, Bring’s Broadway. Fischella, Ray, 95, business owner, April 6, Bring’s Broadway. Gramme, Kathleen, 78, census taker, April 8, Bring’s Broadway. Gregory, Carl, 86, Air Force, April 9, Bring’s Broadway. Hibner, Thomas, 80, financial, Oro Valley, April 13, Adair Avalon. Holcomb, David K., 73, director, Marana, April 6, Marana Mortuary. Humphrey, Pamela, 75, administrator, April 8, Bring’s Broadway. Kruse, Cathryn R., 69, customer service, April 5, Marana Mortuary. Kuhn, Adeline, 91, secretary, April 13, Bring’s Broadway. 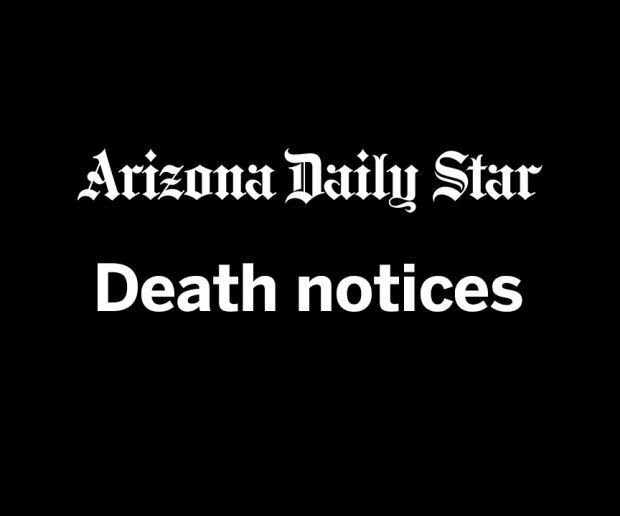 Laguna, Joseph M., 61, miner, Marana, April 5, Marana Mortuary. McKenzie, Bertha, 86, bookkeeper, April 8, Bring’s Broadway. Miller, Richard, 92, division manager, April 5, Bring’s Broadway. Mitchell, Alexander, 78, Air Force, April 8, Bring’s Broadway. Monroe, Margaret, 90, dental assistant, April 6, Bring’s Broadway. Morse, Frederick, 82, physicist, April 12, Bring’s Broadway. Paape, Orpha J., 88, legal secretary, Casa Grande, April 10, Marana Mortuary. Pall, Myrtle, 79, technician, April 8, Bring’s Broadway. Parker, Deborah, 68, travel agent, April 8, Bring’s Broadway. Schaich, Roger, 95, salesman, April 8, Bring’s Broadway. Scherette, Marcus, 54, re modeler, April 9, Bring’s Broadway. Speed, Bleue, 87, accountant, April 5, Bring’s Broadway. Thomasson Jr., Joseph M., 36, computers, April 8, Desert Rose Heather. Van Asdlan, Phyllis, 87, homemaker, April 9, Bring’s Broadway. Welty, Gladys, 88, teacher, April 7, Bring’s Broadway.